It is a longstanding complaint that Israel is unfairly harassed in those international forums that deal with human rights. On the other hand, countries that are too big to harass, such as Russian and China, or that are oil rich, such as the Gulf states, get away with anything. Well, here’s news: Now that Israel has discovered vast offshore deposits of natural gas and even some oil, it can aspire to the status of a Gulf state. Not quite geographically, but in terms of the scruples that others can brush aside in their eagerness to do business. Yet Israel is not putting all its gas eggs in the EU basket. Another report tells us: “In July 2012 President Vladimir Putin visited Israel, largely to discuss the gas fields. The Russian Gazprom has signed a deal with Israel on the future distribution of the large Israel gas resources, and plans to build a floating facility off Cyprus to convert the product to LNG.” The reason given was that the civil war in Syria has frustrated an earlier Gazprom project to pump gas from Iran to the Lebanese coast. In other words, Israel is being courted by both Russia and the EU and can choose what to award to either of those suitors. “Human rights” issues are off that agenda. Now, there has been a lot of fluttering of feathers over the recently publicized EU guidelines on Jewish settlements across the “green line.” We shall turn to that in a moment, but it should not distract our attention from a series of remarkably friendly gestures toward Israel, emanating from Europe in recent months. Precisely at the last meeting of the UN Human Rights Council, the EU took vehement exception to Special Rapporteur Richard Falk’s most recent report, aka baseless diatribe against Israel. It denounced the report in these words: “The EU continues to regret the unbalanced mandate of the Special Rapporteur and is also concerned that parts of the report include political considerations. In the past, the EU emphasized that future reports should be based on a more factual and legal analysis, and we regret to see no genuine progress in that direction. The council needs to be provided with accurate, factual information and solid allegations to fulfill its role and address the human rights situation in occupied Palestinian territory.” In short, please stop trying to fool us with fictions about Israeli human rights violations. There’s lots more, read the whole thing. I’m not so certain I agree with his optimism. There are two tracks in Europe: a business/pragmatic track that wants to be as close to Israel as possible, and an “activist” track that wants to pollute the European mind with the idea that Israel is a genocidal regime. The first is not a counter to the second; it simply ignores it for as long as it can. But the worry is that there will come a tipping point in the future where anyone who publicly backs any aspect of Zionism will be marginalized and berated. It already is happening with a few clueless entertainers who are more worried about appearances than other people, but the entire point of BDS is to create an atmosphere throughout the world that would equate Israel with the worst human rights violators in history. By extension, it would paint anyone who doesn’t condemn Israel as evil themselves. Right now the idea is marginal but the single-minded haters behind BDS have patience and a strategy. The existence of business ties with Israel will dampen any economic consequences to these actions, but if businesses perceive that their own reputations are being damaged to a larger extent than the benefits of working with Israel, they will act in self-interest. 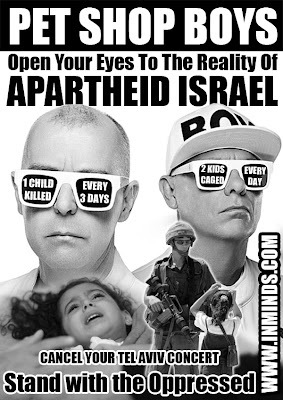 Look how one anti-Israel group responded to the Pet Shop Boys’ decision to play in Israel, pictured to the right. 99% of the Europeans who read that Israel kills one child every three days or jails two children a day would have no problem believing it, even though these are outright lies. This is because there is no decent hasbara campaigns in Europe to expose the lies and the hate behind the BDS crowd. They are far more guilty of blind hatred and bigotry than Israel could ever be – yet they suffer no consequences from baldfaced, bold-faced lies. Their campaigns of distortions and slander will continue to gain traction among the clueless, as indeed most people are. The BDS drones are happiest when Palestinian Arab kids are killed because that gives them more ammunition. One Israeli screw-up that results in too many civilian deaths can be a major tipping point towards the haters. Yes, it is true that Bahrain and other Gulf states can shrug off human rights accusations because of their economic power, but on the other hand there has never been a systematic anti-Saudi or anti-Bahraini campaign in Europe demanding boycott or divestment. Is such a thing really so impossible to imagine? I admit, and have even argued in the past, that the most effective thing Israel can do to combat the delegitimization campaigns is indeed to build up its economy so that it is indispensable to the world. That doesn’t mean that Israel should sit back and allow the haters free reign to lie and poison the minds of millions. Complacency in the face of concerted, directed campaigns against the Jewish state is not smart.